“John would have prevented him, saying, ‘I need to be baptized by you, and do you come to me?’ But Jesus answered him, ‘Let it be so now, for thus it is fitting for us to fulfill all righteousness’” (Matt. 3:14–15). Yesterday we examined how the justice of God demands that He punish sinners. The punishment that mankind deserves is an eternity in hell, and God will never let any sinner go unpunished. Nevertheless, God is also merciful, desiring that some of His creation not suffer His wrath eternally. Therefore God, in order to show His justice and demonstrate His mercy toward sinners, sent Christ to suffer on the cross. In this suffering, God imputed our sin to Christ so that, in His Son, He could satisfy the demands of His justice and prevent His people from having to endure an eternity of punishment. The death of Christ satisfies all of God’s just requirements because the death of Christ was a vicarious substitution. That is, it was a death on our behalf. It was the death of a spotless lamb upon which God could pour out the wrath that His people deserved. The concept of Christ’s death as a vicarious substitution is present from the very beginning of His ministry. We see a clear example of it in the gospel accounts of the baptism of Jesus by John the Baptist. For example, John calls Jesus “The Lamb of God who takes away the sin of the world!” in John 1:29. When we turn to Matthew’s account of Jesus’ baptism, we see an interesting exchange between Jesus and John. Jesus comes to be baptized, but John does not want to do it, correctly recognizing that Jesus does not need to be cleansed from sin (3:13–14). Jesus replies that His baptism was necessary to fulfill all righteousness (v. 15). What are we to make of Jesus’ statement? Well, we must understand that in order for Jesus to be a sinless sacrifice, He had to obey all of the Law perfectly. While God gave His Law to Israel primarily in the five books of Moses, He did not stop adding commandments at that point. The baptism of John was a new commandment, given by God through the Baptist who was the last prophet of the old covenant. 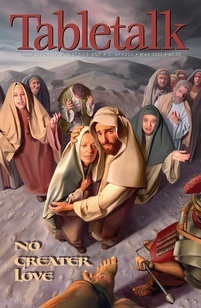 Jesus had to be baptized in order to follow this command, not because He needed to be cleansed from sin, but so that He would fulfill all of God’s commands and possess the righteousness later imputed to us. From birth, Jesus did what we could never do. He obeyed the Law perfectly. And because He did all that God required perfectly, He was qualified to be the spotless lamb that could bear the full penalty for sin. Christ has done for us what we could never do. He has rendered perfect obedience to God in every way. This perfect obedience enabled Him to be a pure lamb, free from every blemish and thus acceptable as the perfect sacrifice. Thank Jesus for doing all that is necessary to bear the wrath that we deserve.